Madame Speaker, it gives me great pleasure and privilege that I stand in this August house and participate in this very important debate. Madam Speaker when the ANC government came to power in 1994, it inherited a society with massive fragmentation and enamours disparities in access to health care. The apartheid government developed a health care system which was sustained through the years by the promulgation of racist legislation and the creation of institutions for the control of the health care sector with the specific aim of sustaining racial segregation and discrimination in health care. To address this historical imbalances and inequities, the ANC government had to design a comprehensive policy and programme to redress social and economic injustices and to completely transform the health care delivery system and to review legislation and institutions related to health. As we undertake radical and decisive action during the second phase of our transition, we do so fully conscious that Gauteng is a much better place than it was before 1994. The Goal of the ANC in Gauteng is to work towards a National Health Insurance that combines state and private health care and is used by all people to spread the medical services equally among rich and poor. We are proud that we have put in place the 6 National core standards namely: Availability of medicines, Cleanliness, Patient safety, Infection Control, Staff attitudes and Reduced Waiting times. This is aimed at improving performance and service delivery to our masses. Especially to the poor of the poorest who’s hope solely to remain at our glorious movement the ANC. According to the latest Ideal Clinic status realisation and maintenance report of the South African National Department of Health Gauteng has achieved the highest percentage of Ideal Clinics across the country. According to Stats SA 2017 mid-year population estimates report, the Gauteng Province comprise the largest share of the South African population with 25.3% of the 56.52 million people estimated to be residing in the province. The increase in life expectancy is attributable to the success of the National Strategic Plan on HIV, AIDS, TB and STI’s and the ART program specifically. Gauteng Province is implementing the UNAIDS 90-90-90 treatment targets for combating HIV. The aim of the campaign is to ensure that by 2020, 90% of all people living with HIV will know their HIV status; 90% of all people with diagnosed HIV infection will receive sustained antiretroviral therapy while 90% of all people receiving antiretroviral therapy will have viral suppression. The province remains the highest contributor to the prevention and treatment of HIV and AIDS with the number of tested clients increasing from tested 2.5 million clients in 2014/15 to 3 million in 2017/18. The number of HIV positive patients retained in care for antiretroviral treatment marginally increased from 726 472 in 2014/15 to 927 825 in 2017/18. It has been reported that a number of skilled people and professionals our continent has lost over the decades is truly frightening since 1990, Africa lost 20 000 academic professionals who left the countries. The ANC in Gauteng is concerned many medical doctors and skilled nurses leave to work in other countries, and those who remain often prefer to work in big cities and private sector and this leads to huge skills shortage in the state health shortage. Madam Speaker health infrastructure delivery has been identified as a key to achieving fundamental reform of the health system in the country. Undoing a legacy of separate development policies, including the unequal distribution of infrastructure between urban and rural areas. We have over the past twenty-four years increased access to healthcare and have built outstanding health public facilities, which includes new clinics and hospitals that are located within a 5km radius. This has improved access to quality healthcare and introduced primary healthcare as the pillar of our public health system. Primary healthcare requires an activist and community-oriented approach to the delivery of healthcare. It is for this reason infrastructure upgrade is one of ANC Government`s priorities and a central pillar in the roll out of National Health Insurance. 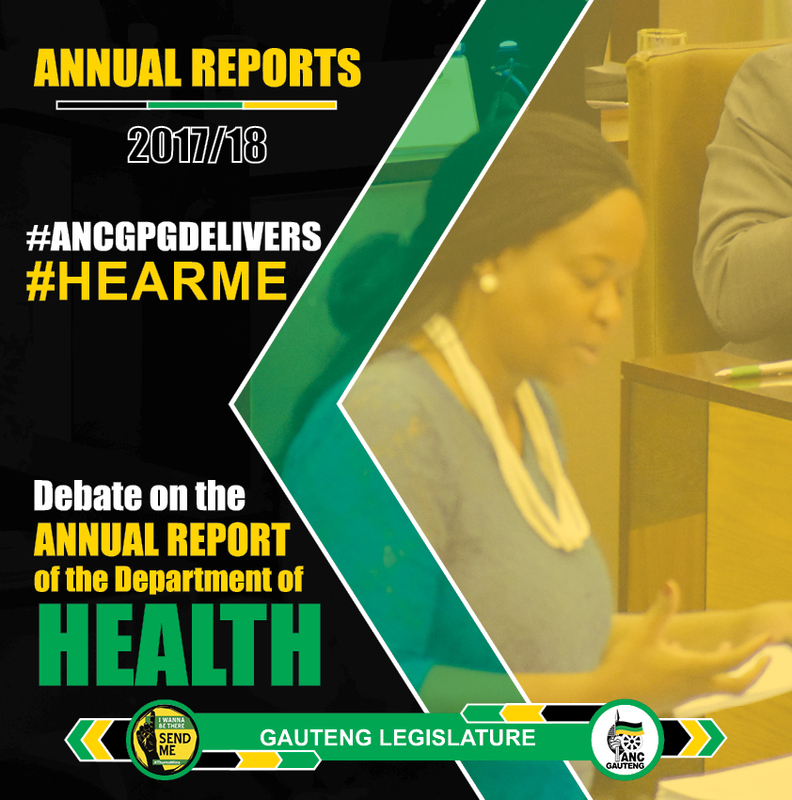 The Goal of the ANC in Gauteng Madam Speaker is to work towards a National Health Insurance that combines state and private health care and is used by all people to spread the medical services equally among rich and poor. Madam Speaker twenty-four years ago we began a new journey to eradicate the oppressive legacy of colonialism and apartheid. It has been 24 years of freedom and democracy in which we have made significant steps towards achieving the vision of the Freedom Charter.